Here we are at Summer Sprint series #3. Today’s bonus announcement: The Legacy Project – a mastermind group for male mental health professionals trying to find balance between work, family, relationships, money, and meaning. My colleague, John Clarke, and I are looking for 8 guys who want to grow together and create a community of accountability. Apply for the Legacy Project at www.thetestingpsychologist.com/legacy. 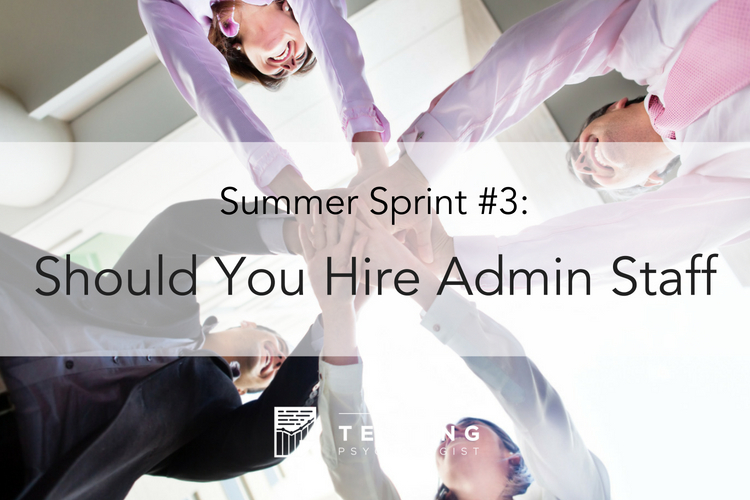 Today I’m talking through how to decide if you can hire admin or billing staff. Short answer – just do it. You will almost always level up by offloading admin tasks to a virtual assistant or billing company. Example: one missed evaluation can cost you $1000-1500. Why not have someone else answer your phones? I waited way too long to find someone – don’t make the same mistake I did.